In its simplest form, an Induction Loop consists of a copper wire which is installed around the perimeter of a room. The copper wire is connected to the Induction Loop amplifier which is fed with a signal from the venue’s public address system, sound system or microphone. The loop amplifier drives an audio current (not an electric current) through the loop which then generates a magnetic field in the area enclosed by the copper wire. Therefore, any hearing device (hearing aid or cochlear implant) properly set to its T-coil setting will receive the signal. T-coil is the Induction or Hearing Loop. FM Systems and Infrared Systems are usually manufacturer specific which means that the system is not always compatible with all hearing aids. 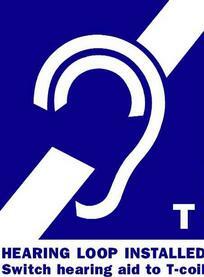 Hence, these systems do not meet the needs of all hearing impaired individuals. 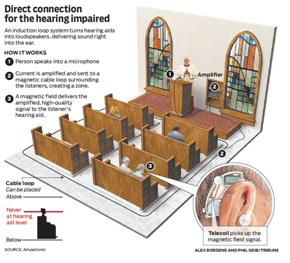 The Induction Loop will provide assistance to all hearing impaired individuals who are using a hearing device with a T-coil that is turned on. The Induction Loop is cost effective, meets ADA requirements and assures better hearing for individuals with hearing loss. In addition, the Induction Loop is the preferred system because it eliminates hygienic concerns since there are no headsets involved. One type of loop is a Conventional Loop. The loop is designed and installed so that the entire area is part of that magnetic field, thus providing adequate amplification or field strength across the venue. Venues such as houses of worship, auditoriums, theatres, and meeting rooms will require this type of loop. Another type of loop is a Counter Loop or Portable Loop. 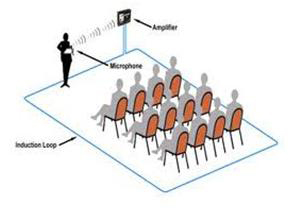 For example, a loop installed at a pharmacy counter will have a microphone installed on the service side of the counter which transmits the voice signal to the T-coil of the customer’s hearing aid. A pad is installed under the pharmacy counter which contains the copper wire that sends the signal to the amplifier. Long term cost is minimized because of low system maintenance. 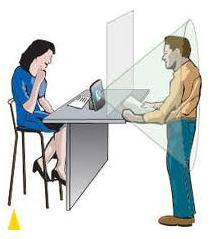 Loop systems will be used more frequently since the system operates in conjunction with the hearing device’s T-coil, thus, eliminating individual stigma of having to request and return visible assistive listening units such as headsets. The number of required portable receiver units is reduced when using a looped system. Loops operate on a universal frequency which is received by any T-coil device. A quote that includes equipment type and cost, design and installation fees, initial calibration of system to meet IEC 60118-4 standard and provide Certificate of Conformity. Where Are Induction Loop Systems Installed? This is a partial list of sites where hearing loops have been installed. The list of hearing loops in New York and in other areas of the United States is growing rapidly. How Do You Know If A Venue Is Looped? Please contact us to schedule your complimentary site survey. Our New York hearing loop team would be delighted to assist you in designing and installing an induction loop system in your venue.